While Ted was one of the biggest surprise hits of 2013, it managed to slip under the radar of a few critics... or maybe just me. Regardless, this review is coming from the perspective of a complete newcomer who knows next to nothing about the foul-mouthed talking bear from Boston or his best pal. 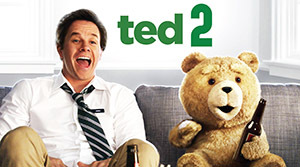 Taken on its own merits, Ted 2 is a scattershot comedy with a few big laughs that works in spells, but begins to sag as it wears on. The main arc follows the newly married supermarket clerk Ted (voiced by Seth MacFarlane) going through a major crisis with his wife - namely, they fight all the time. Learning from a fellow employee that having a child is a surefire way to save a relationship, the two go through various channels. However, this introduces a greater issue - that of whether the bear is a person, or simply a piece of property. 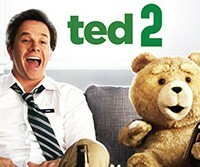 Helping him along the way is his friend John (Mark Wahlberg) and attorney Samantha (Amanda Seyfried). Also stalking the animal is nemesis Donny (Giovanni Ribisi). As assumed, there’s a great camaraderie between Ted and John, peppered with some amusing conversations and discussions about pop culture (including a funny bit on Google searches). And early on, there’s a hilariously disgusting and awkward situation as the two visit a sperm donor clinic and get themselves into all kinds of trouble. Additionally, the film features great cameos with one incredible standout - that of movie tough guy Liam Neeson, asking pointed questions about cereal. The legal scenes are quite interesting as well, introducing a welcome moral to the proceedings. But while there are plenty of laughs from clever observations, there are an equal number of less effective gags. The movie often references other films, having its title character reenact a couple of scenes from classic 80s comedies. It’s all a bit confusing, as these moments add little to the story and also don’t come across as particularly funny. By its final act, it all really seems to run out of gas. As the pair rush off to New York to meet up with a famous attorney (Morgan Freeman), much of the dramatic interest begins to dissipate. A Comic-Con set finale involving a “nerd battle” of sorts between costumed fans doesn’t achieve the manic energy one would hope for and the entire sequence feels forced. There are also two supporting characters physically bullying the attendees - while I’m not the biggest fan of conventions in general, it still came across as rather mean spirited. Events are wrapped up rather swiftly, with all of the characters happy - although one wonders how long before those unresolved issues between Ted and his bride will resurface. While Ted 2 is all over the map tonally, it does have a few very funny scenes and a couple of great snappy lines along the way. It will likely amuse fans, although it would be hard to imagine this effort quite matching (what I’ve been told) is the comedic charm of the original.